Above: Illustration by Stephen Bohannon. Most discussions of fine dining in Santa Fe veer toward places with candles, cloth napkins, and things like chairs. But as a connoisseur of the city’s food trucks, I can vouch for the rising caliber of good food at reasonable prices—if you don’t mind eating in a parking lot. Smart entrepreneurs who really know how to cook, drive, and park are scattered throughout town, often in unusual locations that visitors and even locals miss. Finding them sometimes requires tapping into your inner explorer. There’s no central food-truck location, but in one part of the city—Airport Road, on the south side—enough of them bunch together regularly enough to constitute a certifiable scene. You’ll also find smaller clusters at Meow Wolf, in the Siler Road district, in the big downtown parking lot across from the Roundhouse, and at Tumbleroot, a brewpub, distillery, and music venue on the western reach of Agua Fria Street. Getting started in this niche business takes money, time, effort, and a DIY sensibility. For the most part, the owners of these trucks found their vehicles online, bought them used, did the necessary fix-it work themselves—everything from applying paint jobs and logos to installing appliances—and devised ambitious menus. Vendors are required to obtain a $100 annual permit from the city, earn regulatory approval from the state (the New Mexico Environment Bureau licenses and inspects food trucks with the same scrutiny given to any brick-and-mortar restaurant), and submit to a safety inspection by the Santa Fe Fire Department. Alas, many trucks launch but don’t last. I’ve been frequenting them for years, and I can think of half a dozen good ones that rolled in and rolled away. The trucks I love best are the ones that add fire to the flavor. Here are six worth checking out. Above: Compas Tacos. Photographs by Douglas Merriam. Airport Road, a long, densely commercial stretch that runs from Cerrillos Road to NM 599, is informally known as Little Chihuahua, thanks to a high concentration of Mexican immigrants who’ve given the neighborhood a distinctive feel by opening food trucks, full-service restaurants, groceries, panaderías, and clothing stores with a taste of home. The number of trucks in the area changes—usually at least six—but Compas Tacos, a bright-red structure that sits in the middle of an empty lot just east of the KSK Buddhist Center, is one of the most popular, judging by the number of vehicles clustered around it. 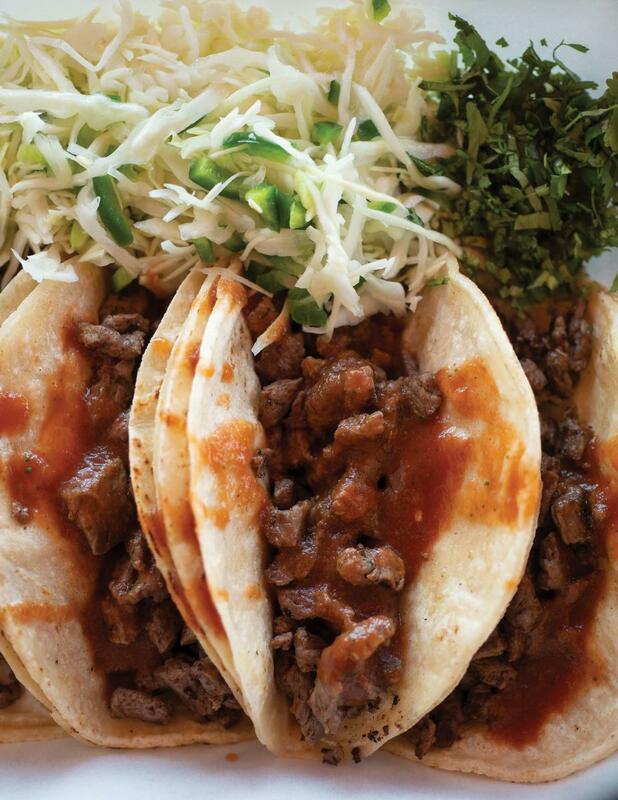 Compas serves a typical mix of Mexican street food—tacos with meat fillings like carne asada (grilled steak) and carnitas (slowly braised pork), burritos, quesadillas, and tortas. Everything is prepared with obvious care. The guiding hands here are Jesus García and his wife, Minerva Rodriguez. García is originally from Chihuahua and has lived in the United States for 25 years. He opened Compas in March of 2017 after racking up several years of experience in Taos restaurants and opening a weekend-only location off Camino las Campanas. “I cook what I like and what I know,” García says through an interpreter. “I never get tired of it.” Most of his customers are from Mexico, he says, but “Americans” stop by, too. One of the most requested items is a mix of shrimp, bacon, and beef called Mar y Tierra (sea and land). García says he loves this line of work and will keep at it, “God willing” and as long as there’s an audience for his food. Angelica says the menu combines tastes of Santa Fe, where she’s from, and Houston, where Chase is from. 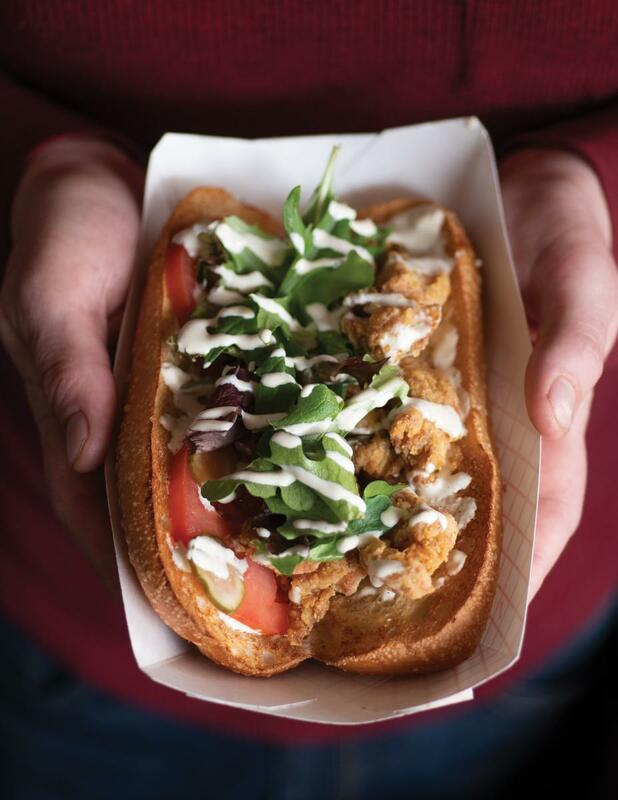 They take pride in using good, fresh ingredients—some of them bought at the Santa Fe Farmers’ Market—and it shows in signature offerings like red-chile-braised beef tacos and fried-green-tomato po’ boys. The menu also features a section called “Not Tacos” (one typical item being a gourmet take on a grilled cheese sandwich) and affordably priced options for pint-size appetites. Have a party on the horizon? They cater, too. 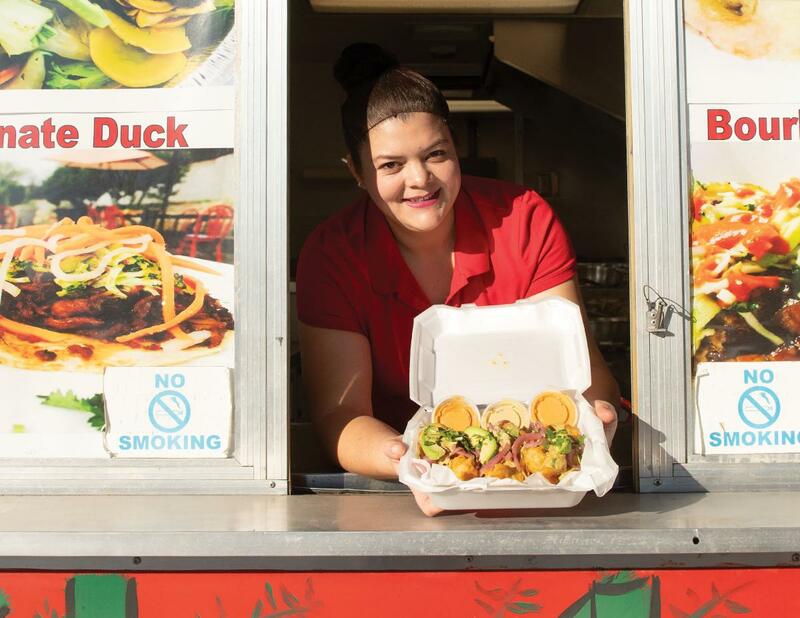 Look for the burly jalapeño mustache curled at the ends—a logo for Chile Toreado, a beloved and battered old trailer (there is also mobile food cart on the Santa Fe Plaza) that’s earned a loyal following since opening in the early 2000s. For years, El Chile Toreado sat in a scruffy parking lot on Cordova Road, near the railroad tracks, but that era recently ended, sending customers into a flurry of panic. You’ll now find it tucked away in a shady spot on Early Street, in front of their future brick-and-mortar restaurant. 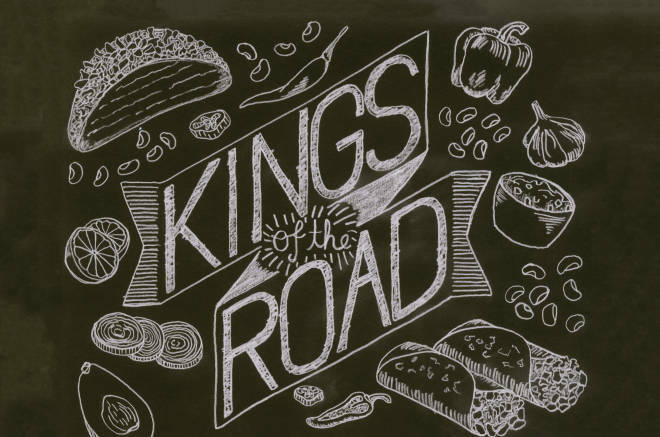 It will one day again relocate, retaining the same white metal box painted with chile peppers and a brightly lettered list of offerings, plus an expansive buffet of toppings—pickled onions, pico de gallo, cabbage, and a salsa picante that will make your ears ring. 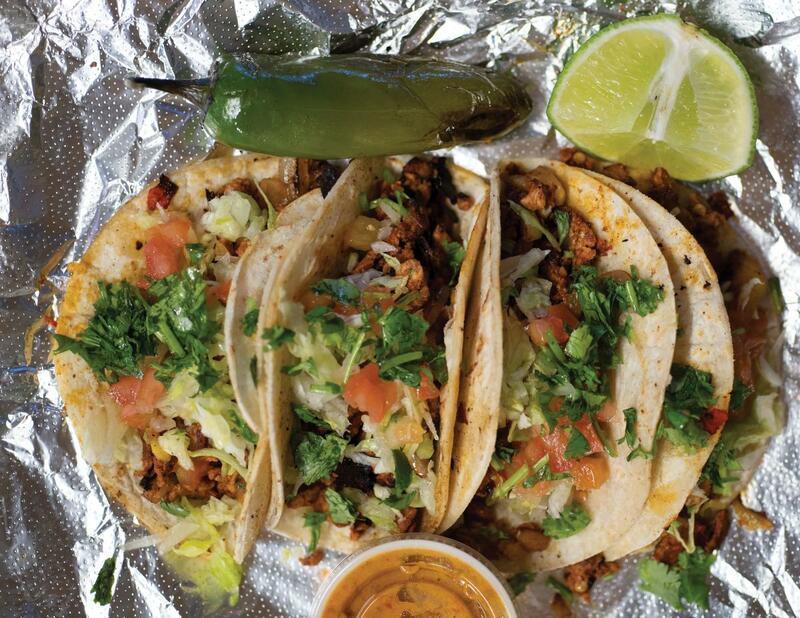 El Chile Toreado’s menu includes tacos, burritos, and quesadillas made with a variety of savory fillings, including carne asada, carnitas, and barbacoa (slow-stewed, spicy beef). They also sell four kinds of hot dogs, a nod to founder Luis Medina’s background in the food business. The 62-year-old Medina moved back and forth between Mexico and the United States for years, finally settling in Los Angeles, where he first became a hot dog vendor. He relocated to Santa Fe after seeing it during a road trip with his daughter, Berenice, who was looking at colleges and eventually attended Le Cordon Bleu. The truck is a family affair—among those at the grill are Berenice and her brother, Lester. Each has a tattoo of their business’ logo. 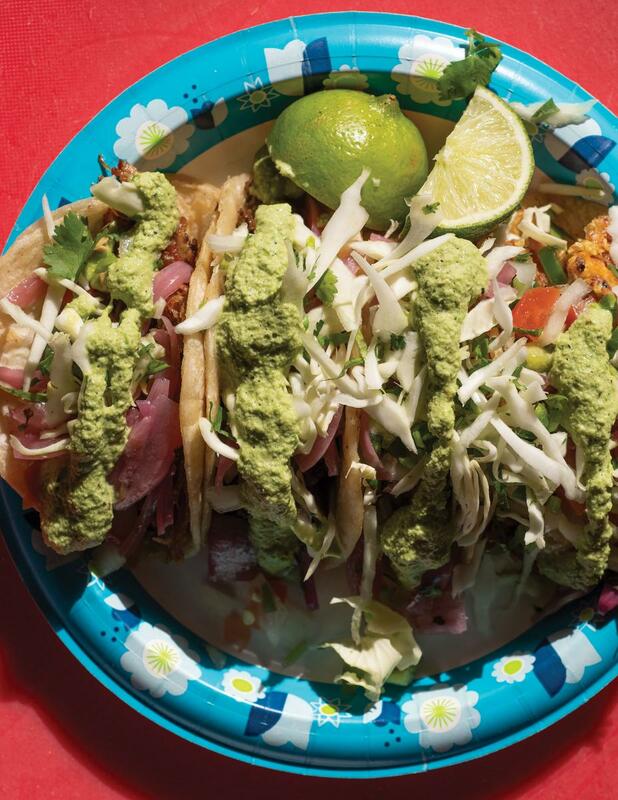 During Lent—which runs from March 6 to April 20 this year—Chile Toreado serves delicious tilapia tacos, partly as a service to patrons who’ve given up meat. Above: The Bonsai Asian Tacos. Ruvalacaba’s menu is inspired by a famous L.A. food-truck operation—Kogi BBQ Food Truck and Catering—and by dining experiences he’s had in San Francisco’s Chinatown. The tacos are pretty spicy and very creative. Current offerings include fantastic tofu tacos, pork belly bourbon tacos, and shrimp tempura tacos. 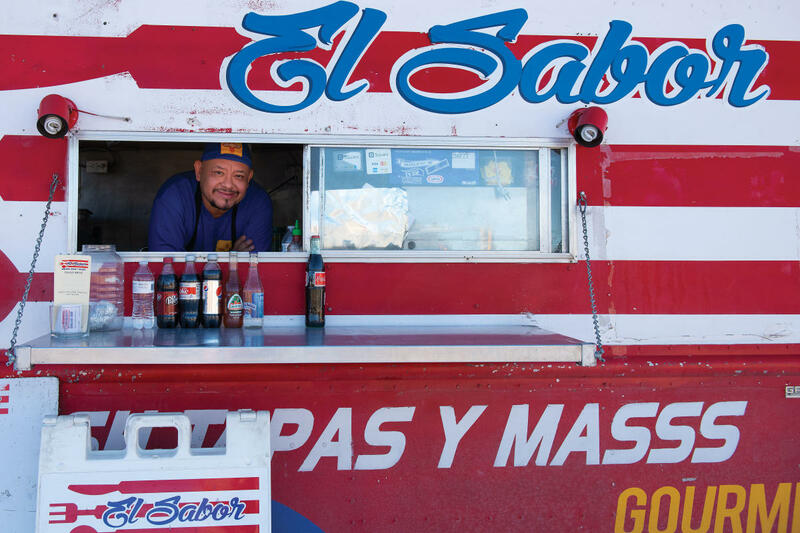 When you pull up to El Sabor Tapas y Masss—which sits across the street from Kaune’s Neighborhood Market, near the Roundhouse—you may notice that the Spanish word for “more” gets two extra letters on the truck’s red, white, and blue paint job. Why? El Sabor’s owner, Ever Paz, is being playful, letting you know that his tapas are more substantial than ones you may encounter elsewhere. And he sells more than just tapas. The standard daily menu contains a whopping 24 items, including flash-fried avocado with pico de gallo and lime yogurt sauce, a hot ham sandwich with tomato, avocado, and green chile, and chicken and beef fajitas. Paz hails from Escuintla, a city in south-central Guatemala that’s roughly the size of Santa Fe. He came to the United States in 1995, when he was 19, and found a home in restaurants, working over the years at the Hotel St. Francis, El Paseo Bar and Grill, and El Farol Restaurant, where he was executive chef for five years. After moving on from there, he bought a used truck in Colorado, worked it over—adding new kitchen equipment and painting the exterior—and opened in May of 2017. His wife, Ana, and son, Kevin, work with him. This spring, he’s planning to debut a Spanish-style sandwich called a bocadillo, which consists of slow-cooked pork tenderloin, provolone cheese, lettuce, and tomato on a bun. He is also hoping to launch El Sabor on the Links, a brick-and-mortar restaurant at Marty Sanchez Links de Santa Fe Golf Course, which would serve breakfast, lunch, and bar menus. La Loncherita serves pupusas—a Central American style of turnover with a thick corn masa exterior and a savory filling, charred on a griddle. The owners of this bright-blue truck, husband-and-wife team Geovanni Menendez and Vilma Peraza, have roots in El Salvador. Menendez is from Santa Ana, the nation’s third-largest city and a historic coffee-processing hub. Peraza is from Chalatenango, a smaller municipality near the border of Honduras. They’ve been in Santa Fe for 13 years and met each other here, opening the truck in June of 2015. It sits in a rutted dirt lot near major shopping centers off busy and cluttered St. Michael’s Drive. Menendez handles the prep work; Peraza does the cooking. She learned to make pupusas at a restaurant in El Salvador, and one of the truck’s signature fillings—chicharrón, which in El Salvador means cooked, chopped pork—is a secret family recipe she got from her mother. A good bet is the truck’s most popular order: a pupusa revuelta containing chicharrón, beans, cheese, and lorocoan, an edible flower bud that grows in Central America and Mexico. It comes with a side of curtido—a tangy pickled cabbage salad—and two choices of salsa (picante or regular). One or two is enough for lunch, and they cost only $2 each. There are vegetarian options, too, including espinacas (spinach) and mushroom. Dollar for dollar, this is one of the best lunch deals in town. Three other Santa Fe trucks that can fill you up. Parked in front of a pawn shop, this cheerful red-and-yellow trailer serves tacos, tortas, quesadillas, hamburgers, and Frito pies. A next-door neighbor of El Sabor, Santafamous makes one of the best breakfast burritos in the city. Offers three kinds of chicken—curry, barbecue, and jerk—with tasty sides.